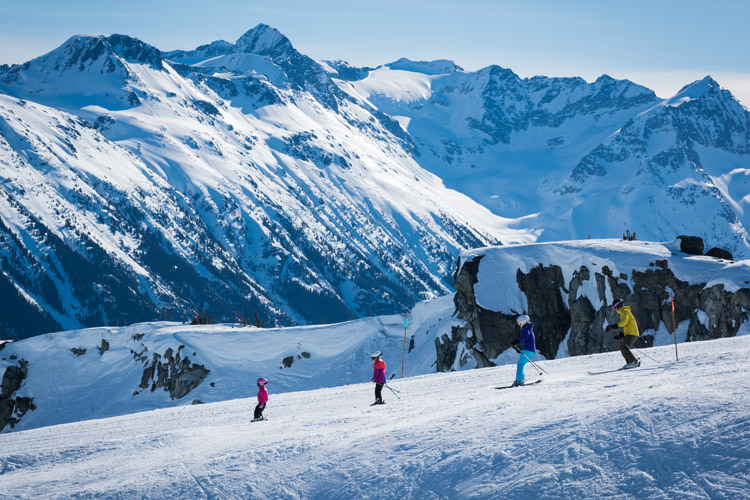 Child Minding in Whistler? Don’t Mind if I Do. Well, the transformation is complete. Once a fast-living Whistler local and 15-year resident I have transformed into an eager tourist and happy new Dad. 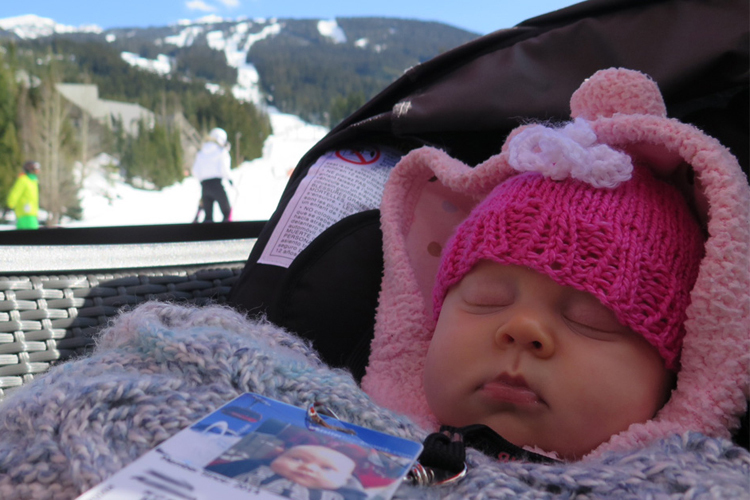 After I finished work at the 2014 Winter Games I returned home to Ontario where my wife and I packed up our three-month old daughter and headed for Whistler— our first trip as a family. The snow was falling when we landed in Vancouver but we managed to secure a good 4×4 vehicle from a friend and soon had it loaded with strollers, a car seat, boxes of diapers, my wife’s snowboard and some new Salomon Rockers for me. 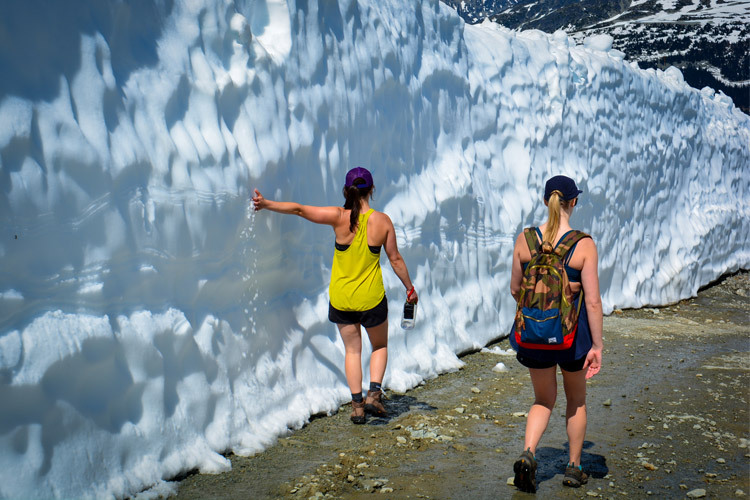 As soon as I pointed it north up Highway 99 the memories began flooding back and our conversation shifted from how beautiful Howe Sound looked under fresh snow to all the Whistler “Must-Do’s” I wanted to share with my new family. Our ambitions seemed somewhat lofty considering we were traveling with a three-month old nugget for the first time but ignorance is bliss and we didn’t have any reason to think we couldn’t “do it all.” Our stoke level was very high when we arrived at our hotel in Creekside and saw just how much snow had fallen that day. First Unexpectedly Awesome Parenting Moment: Picking up our ski passes at Guest Services. When they printed off my daughters pass, with her picture on it, I was almost moved to tears. The next morning was just like the old snowphone message used to say, “Pitter patter, let’s get at ‘er.” The mountains had been hit with plenty of fresh snow but getting up the hill with an infant is substantially slower than the get-dressed-and-go powder mornings of my past. Our daughter generally rises long before the sun though, so we were still able to make it to the Whistler Village Gondola at a decent time, and with enough gear to outfit a small team. Thankfully Douglas, the lift attendant, greeted us with a high-five and a helping hand and soon all our extra baby gear was happily loaded into the gondola. I spent the duration of the ride spinning my daughter in slow 360’s, showing her the views. At the top we took the obligatory photos of baby with Peak Chair in behind before boarding the PEAK 2 PEAK Gondola and heading for Blackcomb Mountain. Awesome Parenting Moment #2: It’s incredible that we can access the tops of both mountains with a 3-month old in a warm, safe gondola. No cold noses, no frozen diapers. At the Rendezvous Lodge a Mountain Host named Joe helped us lug around the baby seat/bag combo and found us a corner table to use as basecamp for the day. My wife was eager to gear up and start shredding so I took first shift of alpine child minding. “I’ll be back in about an hour,” she shouted back as she headed out the door. Baby and I read some fourteen-page books, she took a bottle and I zoned out on the scenery for about an hour and 45 minutes when I got a text from the wife explaining she had just found a sweet zone off the new Crystal Chair and was sneaking a few more turns in before heading back. After nine months of pregnancy and the labours of childbirth it was so nice to see her walk back into the lodge with a grin from ear to ear and fresh powder dusting her goggles. Equally awesome, now it was my chance to arc some turns down the mountain. I hit some old favourite spots and managed to find a few pockets of perfectly untracked snow. It was so easy to explore and enjoy the mountain knowing I was always only one chairlift ride away from my family if they needed me. At the end of the day my wife mentioned that it was pointless for both of us to download so she packed me up like a Sherpa, grabbed her board and rode down to the Village. We spent a few days alternating skiing and playing with the kid in the Lodge. Old friends would stop by periodically and my wife and I even got to share a few runs together. 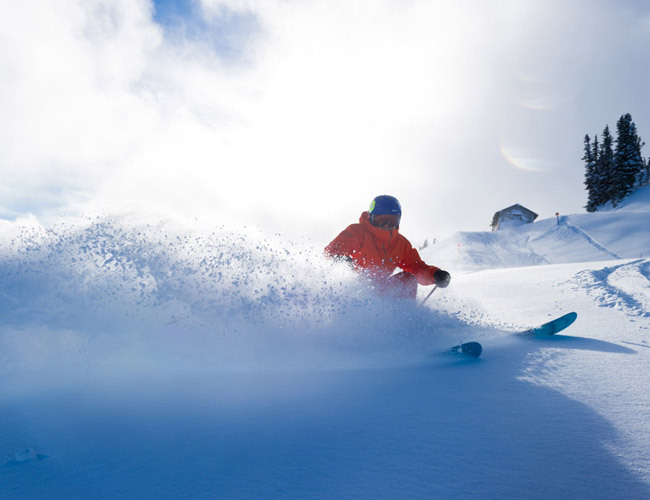 Then our professional babysitter arrived – Grandma – and the ski days really got epic for everyone. 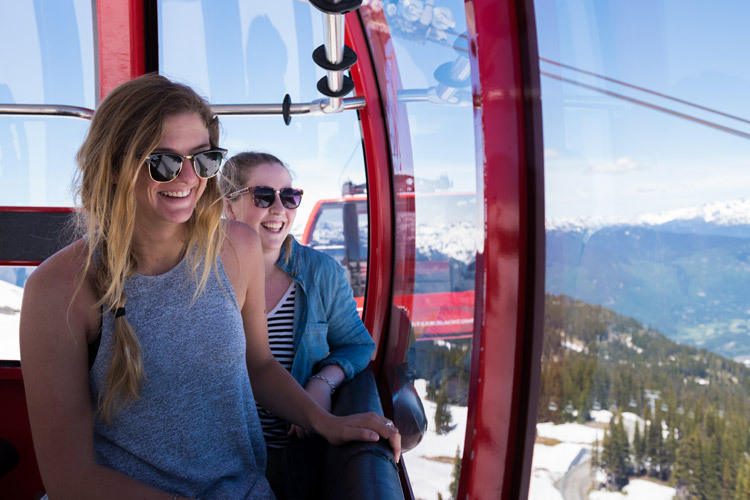 Grandma had never been atop a mountain or ridden a gondola but we coaxed her aboard and it was amazing to watch her eyes expand with excitement as we rose higher and higher and the Whistler views unraveled before her. 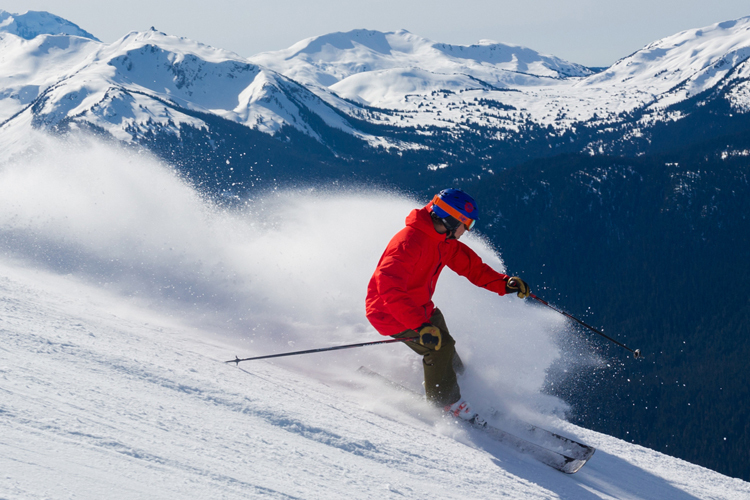 As a former ski pro I’ve enjoyed a very fortunate life of traveling the world visiting different ski resorts but I’m still blown away by the terrain, the community and the scenery in Whistler. On down days we’d hit the pool at Meadow Park, or push the stroller around Nita Lake, or wander the Village and hit the Whistler Public Library to read some kids’ books. Everything that felt overwhelming when we first considered a family trip to Whistler with a tiny little baby turned out to be super positive and amazing once we arrived. This community is incredible and I have to thank the dudes at the Merlins who dragged over an extra outdoor heater for us on the patio and Amy at Sushi Village for finding a way to work with our car seat/sleeping daughter during the busiest time of her night. 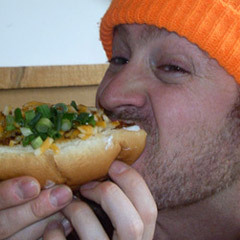 Also, big love to Kelly and Les at the Southside Diner for their warm smiles and willingness to help us out, that true, old school Whistler spirit of hospitality that I remember so well from my days as a local is still very much alive here. And I’m going to end it with that. The wife is throwing down Creekside laps and Grandma has the baby asleep. I’m hitting the gondola to see if I can keep up to my baby’s mama on the Dave Murray Downhill. Awesome Parenting Moment #3: Every time I hear the shutter snap on my camera. My daughter will never remember this trip, but we have proof that she was here and I have no doubt the mountain air and Whistler energy will always be a part of who she becomes.